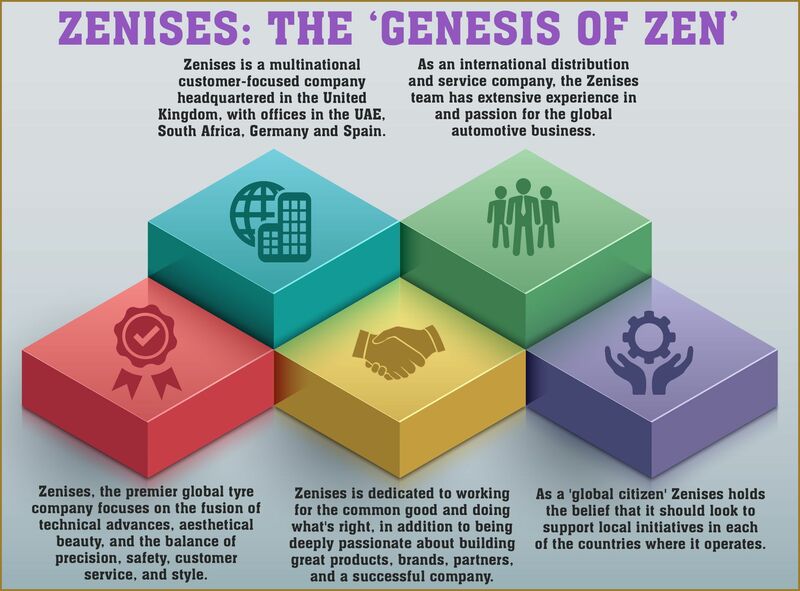 Zenises Group is an international corporation that offers a unique approach to tyres. With its headquarters in the UK and a presence in twenty countries, Zenises is focused on spreading a spirit of global partnership through quality tyre products and a philosophy of social responsibility. Its company name combines the words ‘Zen’ and ‘Genesis’ to echo their reflective corporate philosophy. The corporation embodies this purpose in its day-to-day business and through its affiliate organisations which support disadvantaged people around the world. Zenises was founded, and has been led since by Harjeev Kandhari, an experienced entrepreneur as well as an advocate for corporate philanthropy. Educated at Oxford University with an MBA from INSEAD France, Kandhari had already gained investment experience at Merrill Lynch and globally redesigned his family’s business in Dubai, before he went on to found Zenises. Within six months, Zenises had opened offices in six countries besides the UK, and now operates in South Africa and UAE, as well as throughout most of Europe. Since then, Zenises Group has defined itself as an important voice in the automotive industry, with tyre brands that appeal to adventurous and safety conscious drivers alike. Zenises’ passion for the industry isn’t just theoretical. Harjeev Kandhari recognises the impact inferior tyres have on a driving experience, pointing out the self-evident, but important fact, ‘tyres are the only connection you have with the road’. Paint and trim might be more noticeable, but tyres are the driver’s instrument. They respond to each intention and control the motion of the car. A good driver depends on tyres like a violinist depends on a Stradivarius violin. Only in this case, safety is at stake as well as performance. The high performance Z tyre that was unveiled in Europe in 2014 is just one of Zenises’ iconic brands. Z tyres are a favourite among people who love to drive; the Z line offers the highest standard in performance and fuel economy at an affordable price, combining a streamlined aesthetic with the high wet-grip rating and sidewall stability that are essential for narrow roads and close cornering. It didn’t take long for the Z brand to take off, with a second South African launch that included events across several different venues organised by Tyrecor, Zenises’ South African partner. The main gala in Johannesburg was hosted by Harjeev Kandhari, CEO of both companies. As well as the Z brand, Zenises offers a traditional Westlake line of tyres made by the well-known Hangzhou Zhongce Rubber Company. This company has been manufacturing rubber products in China since 1958. It is the largest tyre producer in that country and ranks among the top ten in world sales. Zhongce tyres are found on every continent, but Zenises commands the European Market with a line of high quality tyres manufactured on state of the art equipment. Zenises’ products include options for all types of motorists. A newer line of T tyres offers models for drivers who make economic value a priority, with winter grip tyres available for larger vehicles and four wheel drive. Lines from Kapsen and Ardent tyres have the latest in technological design for vans and SUV’s as well as cars. Commercial truck and bus tyres manufactured to fit European regulations are also available through several different brands. Rather than simply securing individual sales, Zenises is focused on building relationships; quality products offered in a spirit of service inspire customer loyalty through satisfaction. However, Zenises doesn’t just build relationships with its customers. The company philosophy incorporates a belief in giving back to the communities it serves. With an international presence, Zenises defines itself as a global citizen and feels a responsibility to help the disadvantaged communities in those countries. Zenises Foundation was conceived with that goal in mind. The initial programme, Z Aspire, funds education at all levels for underprivileged children and young adults in India. As well as providing schooling, the organisation offers mentorship, job training, and job placement opportunities for those that complete the programme. Z Aspire provides three scholarships to Oxford University, as well as an endowment for a university chair at St Peter’s College. Several newer organisations have been added to further Zenises’ philanthropic purpose: Westlake Wishes works to feed 125,000 people in a single day in the Indian holy city of Amritsar and T Outreach supports problem solving initiatives in the countries where Zenises does business. Zenises has turned tyre distribution into a compassionate, global way of life. The entire Zenises team offers automotive expertise that is unmatched in the industry, and Harjeev Kandhari’s focus on quality and social accountability has also made the organisation an international leader in corporate responsibility. With an exciting future ahead, Zenises continues to break boundaries and challenge the status quo at all levels.